Although I'm sad to say goodbye to our alleged Summer, which seems to have been over all to fast, I do love Autumn beauty and the Clarins Autumn Collection really is quite gorgeous! Not just the beautiful golden packaging but the stunning new shades. Although I'm a certified cream eyeshadow fanatic, I've never tried a formula quite like this. It's a sort of a cushion-y formula that applies like a cream but looks like a super-pigmented powder on the lids. Heather is just my perfect mauve-taupe-grey shade. In the evening I use this as a base or otherwise in the outer 'v' part of my eyelid. Carbon, I use a little differently. It's a matte with a little glitter in it so I really like it on a little angled brush to line my upper eyelashes, to get right in between them and add some volume. If it's a smoky eye look then this can be smudged out too. These last me all day on my eyelids too, which is a bonus, without smudging or transfer. 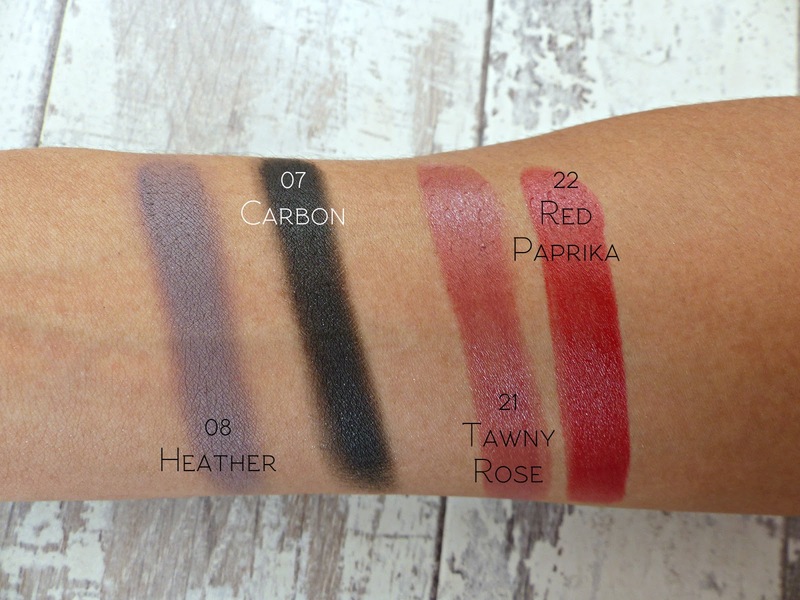 If you find traditional cream eyeshadows slip around a bit on you then give these a go. These are a really nice, sheeny but pigmented lipstick formula that feels amazingly hydrating on the lips. They don't last the longest time but I don't get a patchy fade from them so re-applying doesn't bother me so much. Whilst Red Paprika has a little transfer, it's still much less than with other glossier brights I own and it stays on the lips longer than you'd expect. Tawny Rose is my absolute perfect 'my lips but better' shade. I love it for work as it looks natural but adds a little bit of something, enhancing my natural lip colour. Red Paprika is in a similar colour family to the only red I'd ever liked before; MAC Chili. I find a deeper red with a warmer tone and little hints of terracotta suit me best and Red Paprika fits the bill. 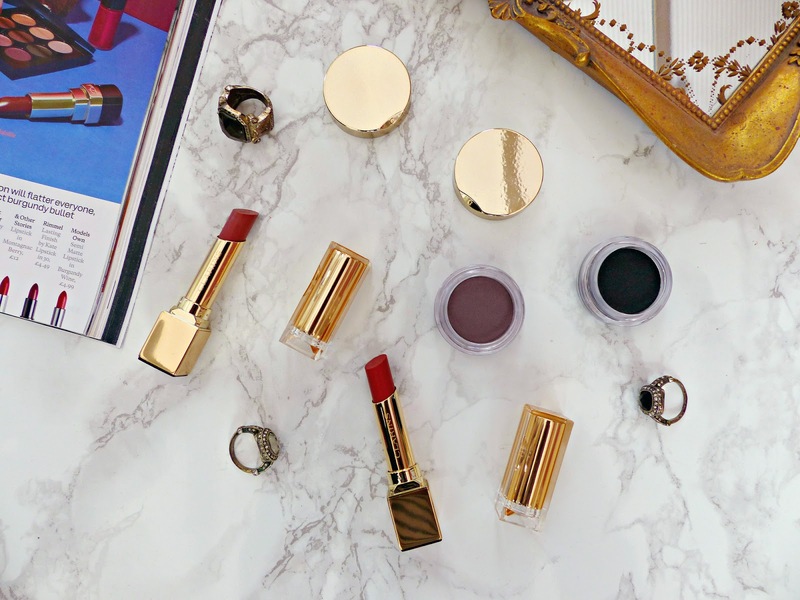 Have you tried anything from the Clarins Autumn Collection? Is there anything you have your eye on? I'm utterly obsessed with the Ombré Matt Eyeshadows from Clarins, I'm gonna need that purple shade - it's gorgeous! What an incredible collection, I adore the lipstick shades! Heather looks stunning, I am yet to get to a counter to try out anything from this brand yet but it is on my list of things to do, soon! Their eyeshadows always sound incredible, I really need to try one to see what they're like! The Rouge Eclat Lipstick in Woodrose has been a go to Autumn lip of mine for a couple of years now, so the shade Tawny Rose really appeals to me :). Definitely checking that out when I pass a Clarins counter! These are all such beautiful shades!n I especially love the lipsticks! Those shadows look incredible. I'm definitely going to need to give them a go! The Heather shade sounds amazing! This collection looks really lovely. I'm totally an Autumn girl. The cream shadow in Heather...I swoon. So smokey and beautiful! This collection looks gorgeous, the cream shadow in 'Heather' has particularly caught my eye! I do find that traditional cream shadows slip around my lids so I'm happy to hear that these are long lasting. This collection looks stunning, everything looks so gorgeously pigmented! 22 Red Paprika is gorgeous! It does not matter how many reds I own I still want more. haha Beauty lovers struggle.